lv_bp_nr = lr_entity->get_property_as_string( ‘BP_NUMBER’ ). LOOP AT lt_ppr INTO ls_ppr. 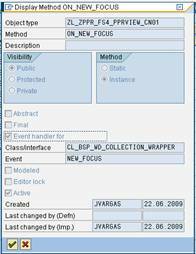 coll_wrapper TYPE REF TO cl_bsp_wd_collection_wrapper. CHECK lv_entity IS BOUND AND lv_entity->alive( ) = abap_true. * lv_partner = lv_entity->get_property_as_string( ‘BP_NUMBER’ ). * zpprt->on_new_focus( focus_bo = lv_entity ). me->typed_context->zpprt->on_new_focus( focus_bo = lv_entity ). Useful in many real time scenarios. i need to create a custom fact sheet with a assignment block and link for that has to be given in a navigation bar . once if you click that navigation bar the custom fact sheet has to be displayed. am relatively very new to crm. kindly help me in this aspect.